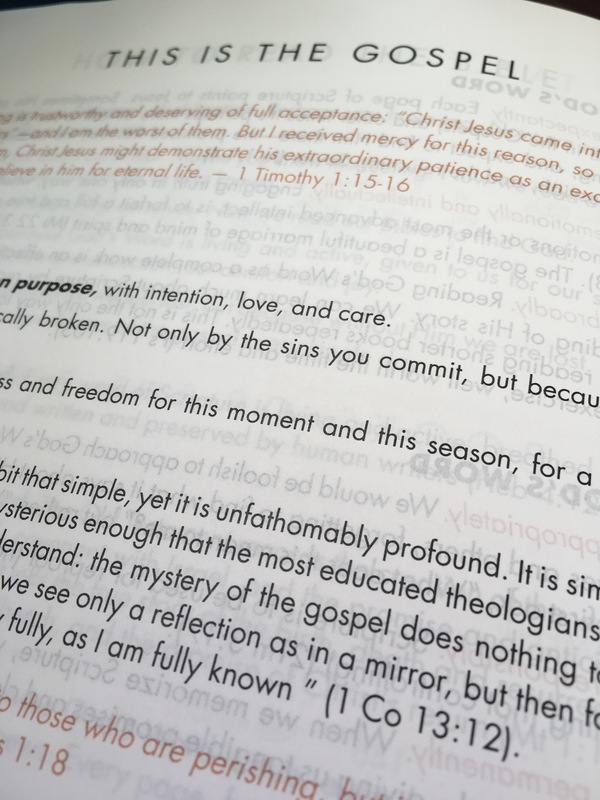 If you follow the Notes From The Parsonage Facebook page, you may have already heard about She Reads Truth. I had signed up for their Auto-Ship program for their Devotion books. 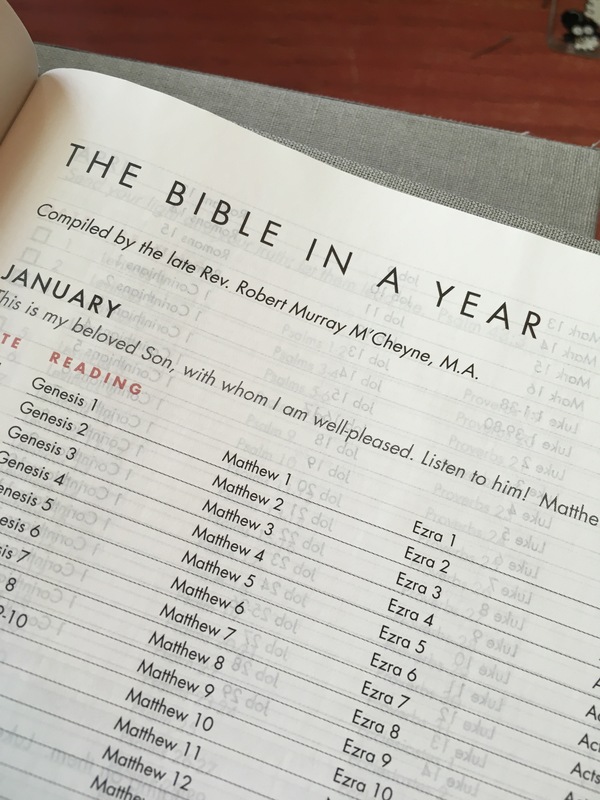 They release a new one each month, and most of the book is just Scripture. It makes devotional reading very easy to do on a daily basis because it is all right there. 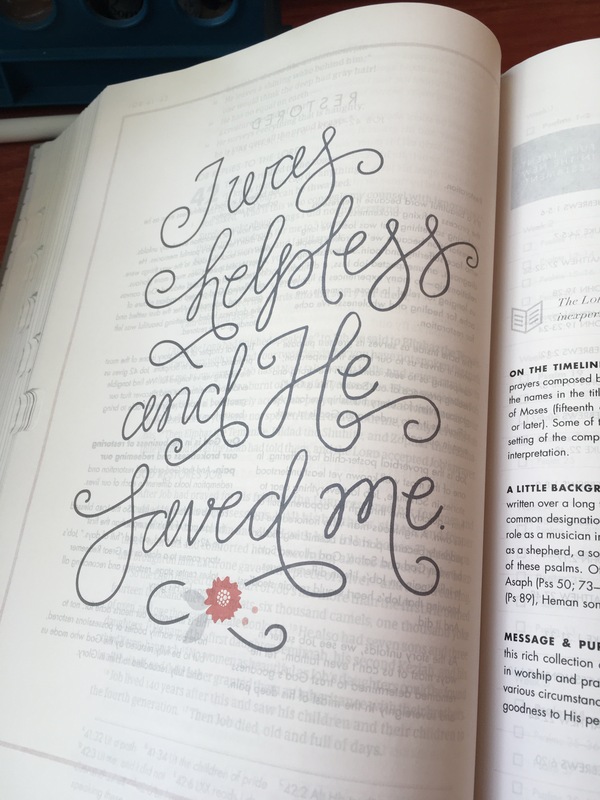 You can also scribble notes and prayers right there on the pages on not feel bad about “messing up” your Bible. 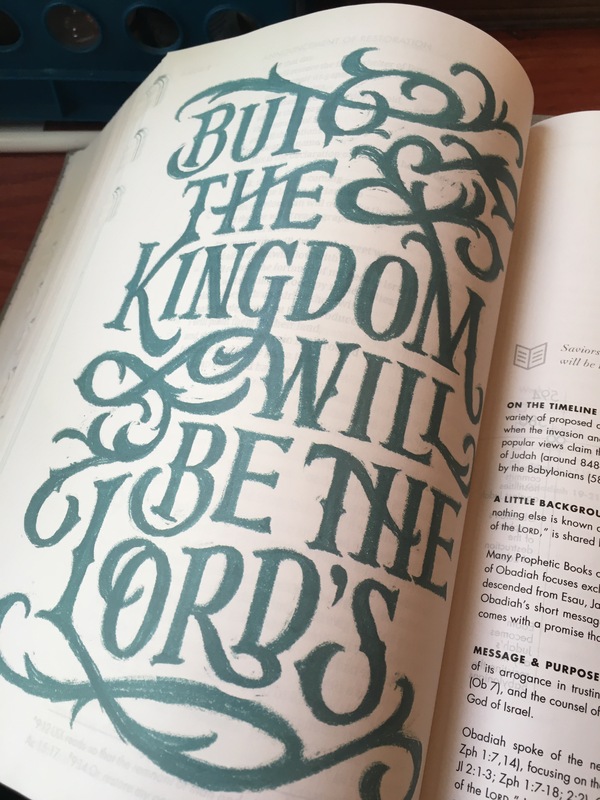 (Not that I am at all averse to writing in my Bible.) 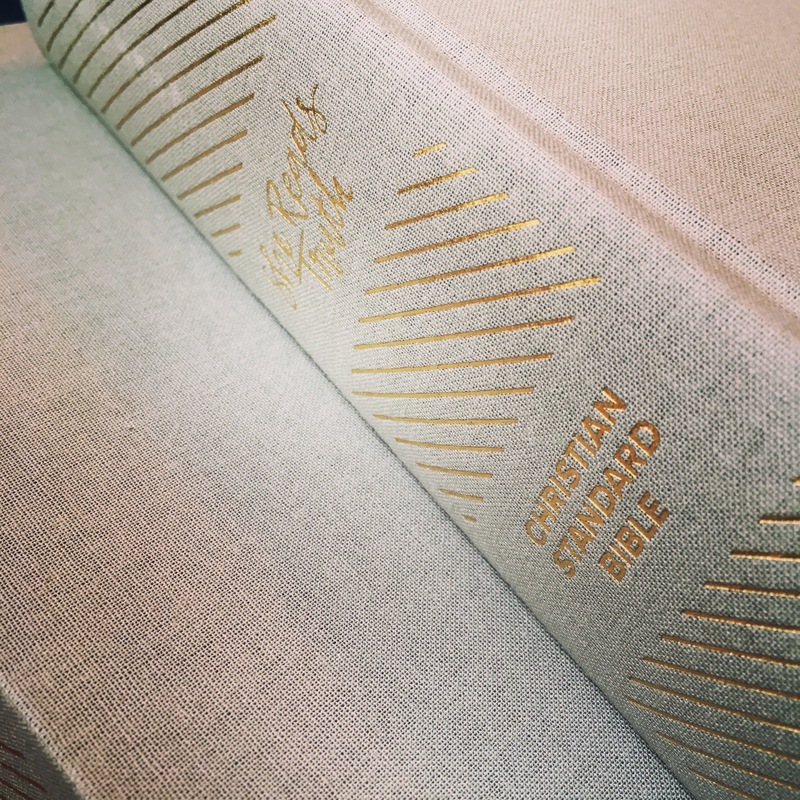 The books are beautifully done. 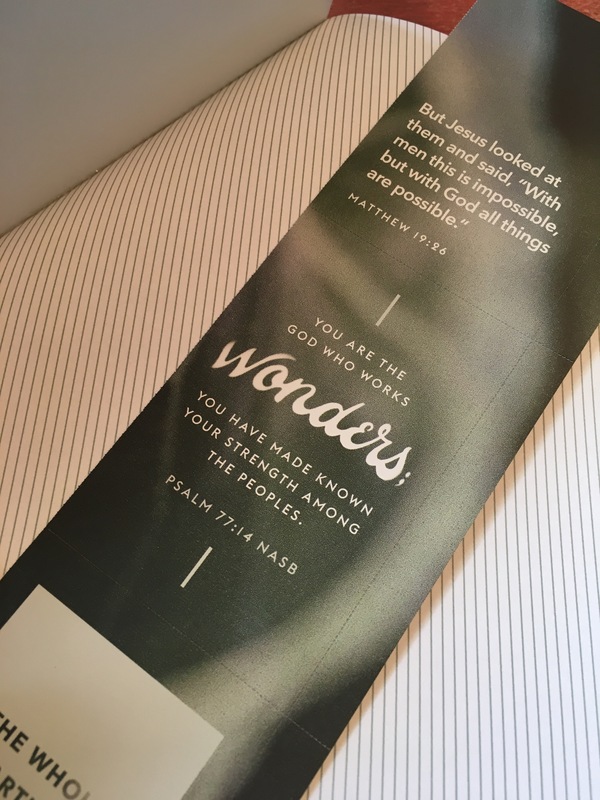 They contain beautiful art, scripture memorization cards, some have recipes, reflection questions, and charts. 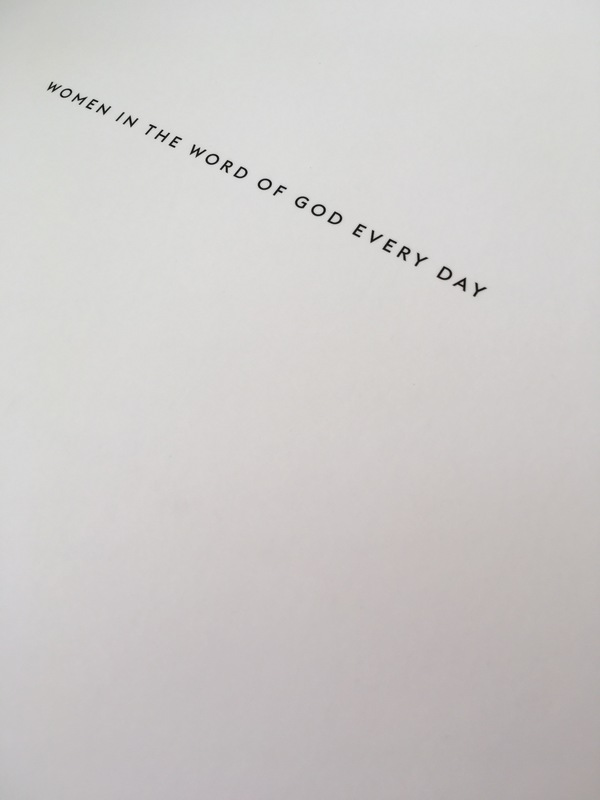 It is a very Bible centered devotion. Now, they also have an app. 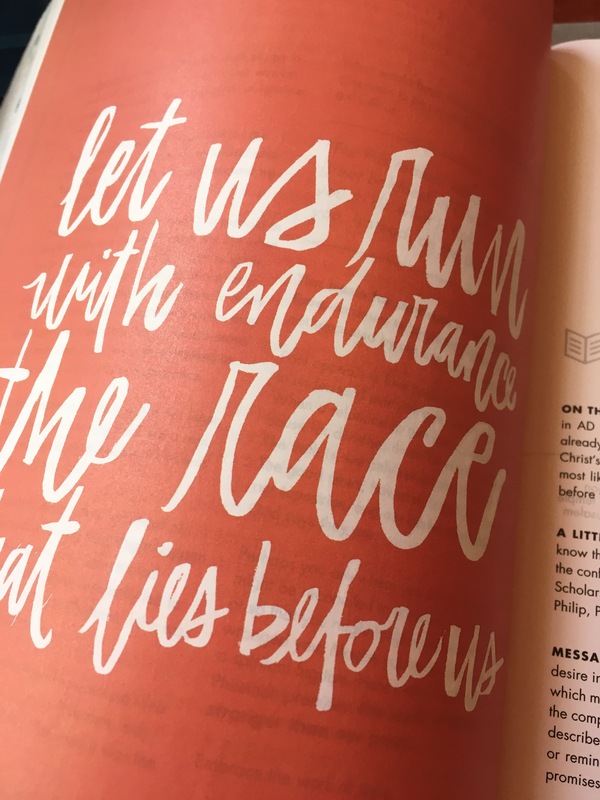 You can download the memory verses each week to use as a screen saver on your phone or tablet. I have found this particularly helpful in keeping the memory verse in front of me throughout the week. 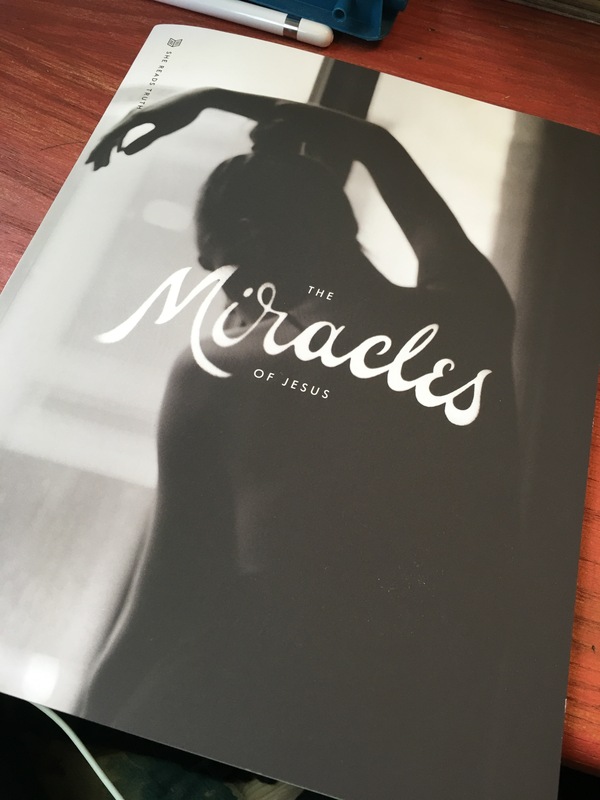 You can also purchase the devotions in digital form for significantly cheaper through the app. 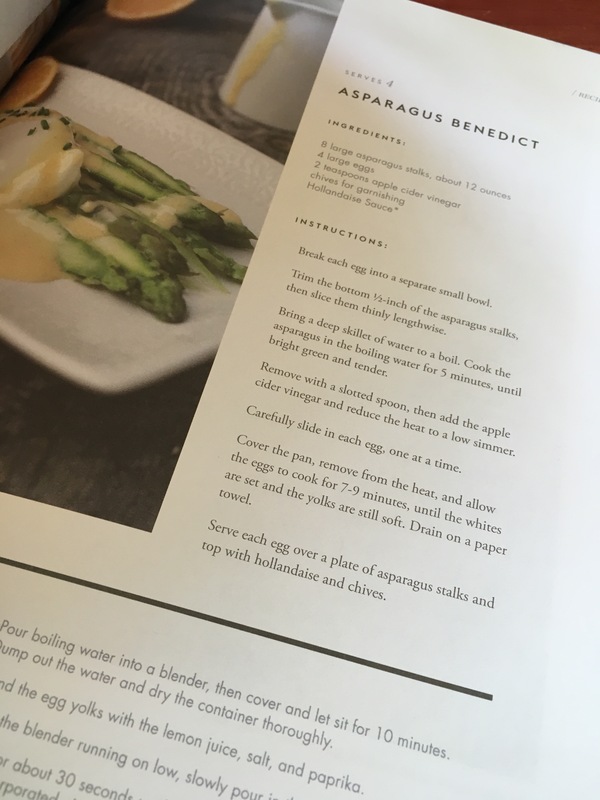 (The AutoShip program of the books is $29 a month with shipping. Each book on the app is $1.99 to $2.99 each. They even have some shorter books for free.) 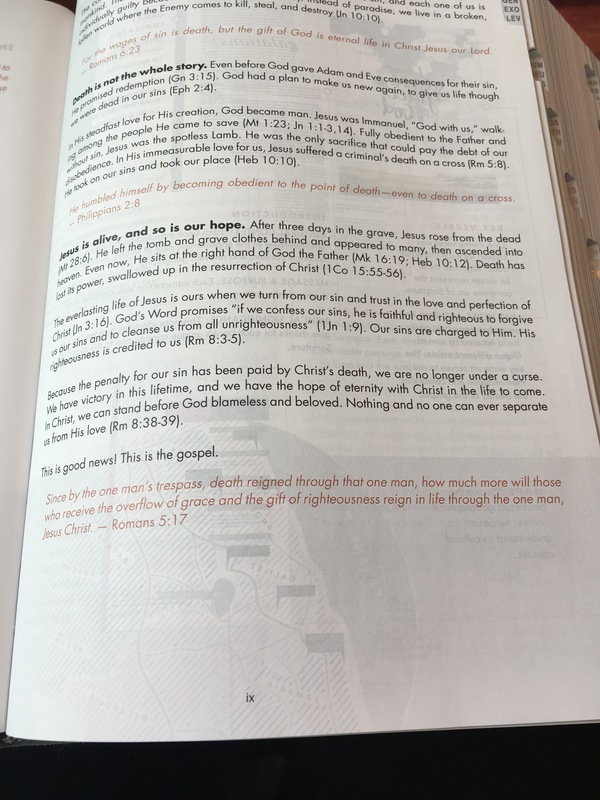 The app also has a Bible on it, if you don’t already have a Bible app you like. I have really enjoyed the books. 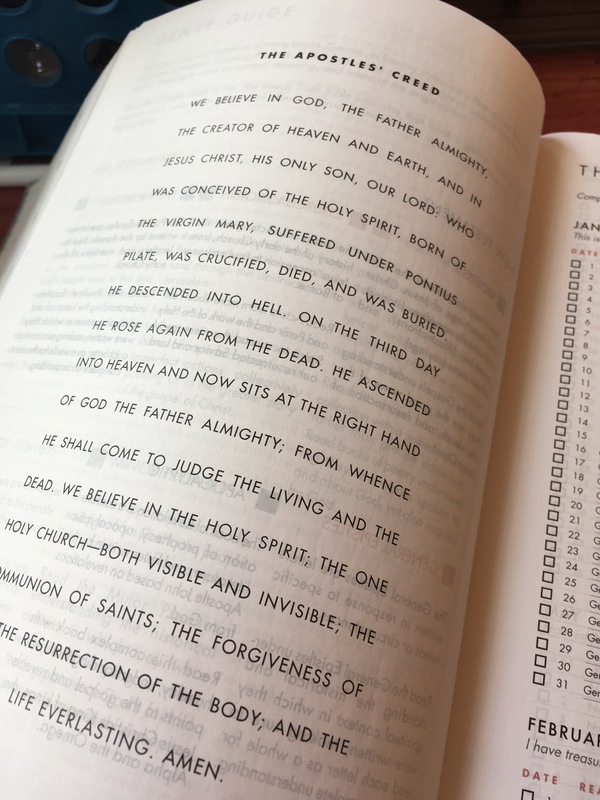 They have Scripture reading from the Old and New Testament each day, which I really enjoy. They connect the Scriptures very well. 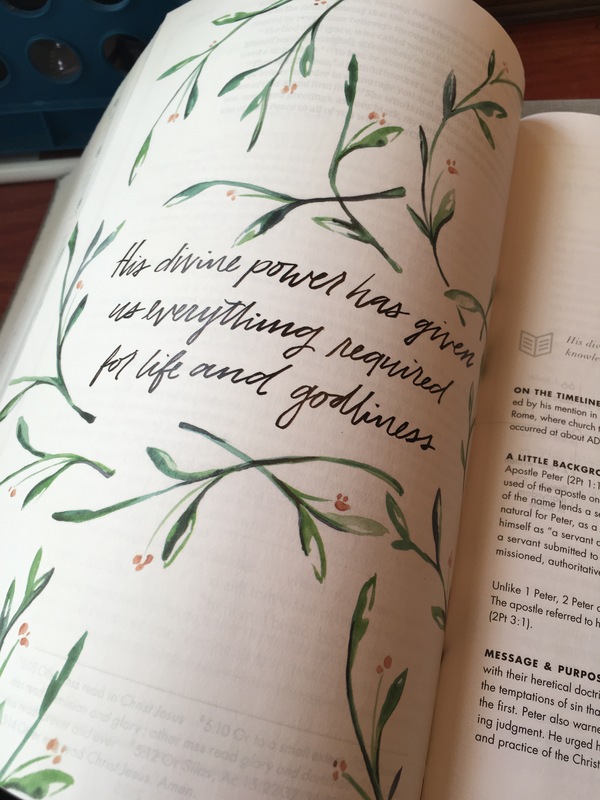 I have been very blessed in my personal devotion time with this resource and I absolutely highly recommend it. They also offer a He Reads Truth version for men. I haven’t purchased any of these, personally. 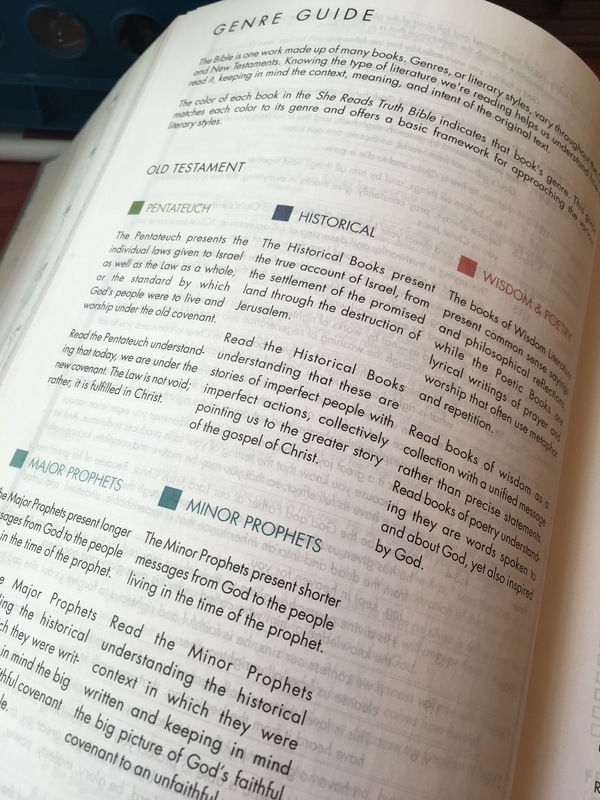 (The Pastor uses the Ancient Christian Devotional books for his daily reading.) All Scripture used for She Reads Truth is Holman Christian Standard translation. 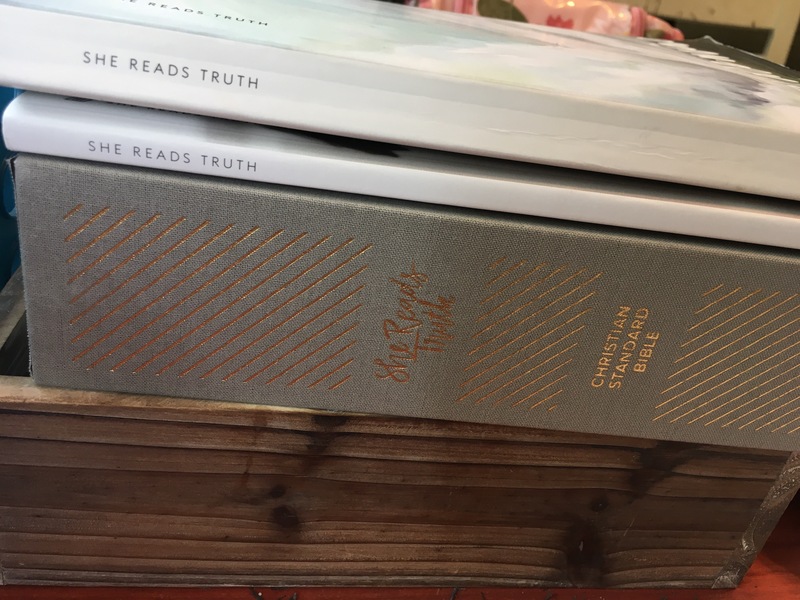 When She Reads Truth announced they were releasing a Bible, I preordered it immediately. I had a hard time choosing my cover and options, because they all looked so beautiful. I settled on the Gray Linen Indexed version. 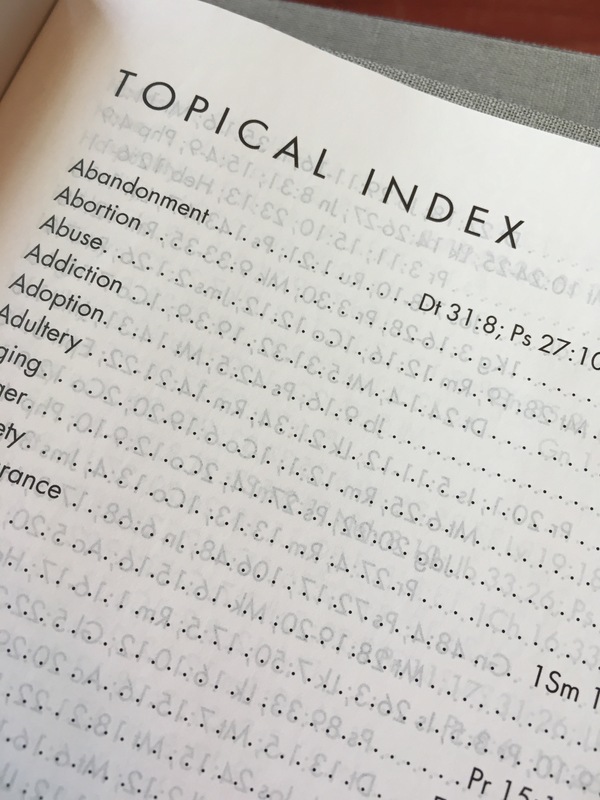 I have never owned an indexed Bible, so I thought I would give that a try. Now that it has come in, I can give you an overview! It comes in a very sturdy box to match. 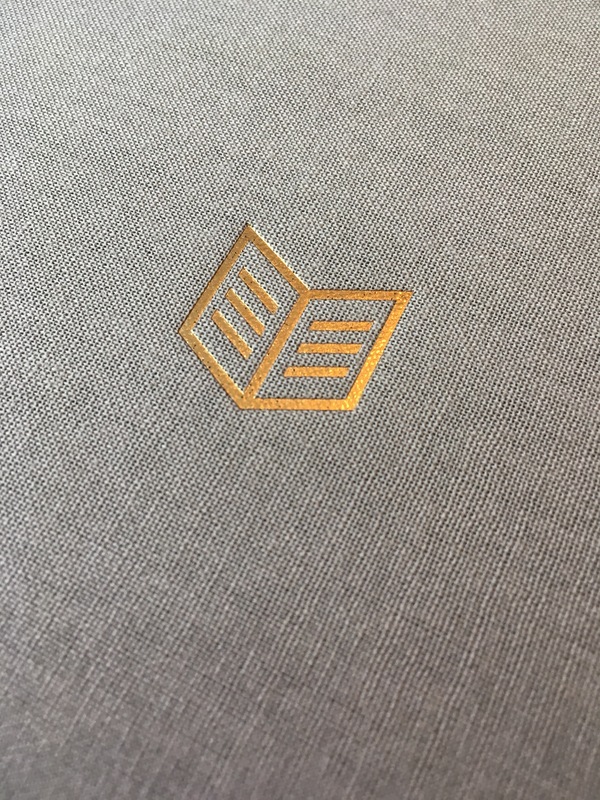 The linen cover is very nice, like an old book. 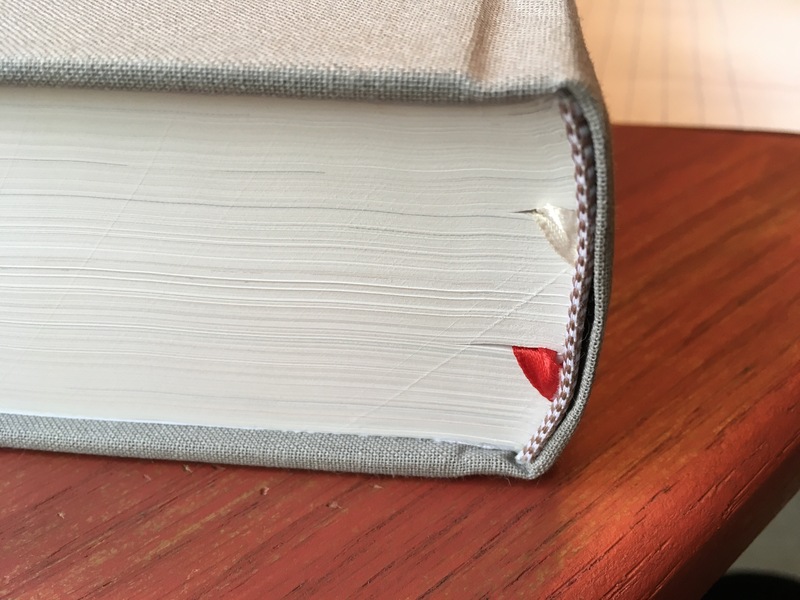 The indexed tabs have 3 books per tab. 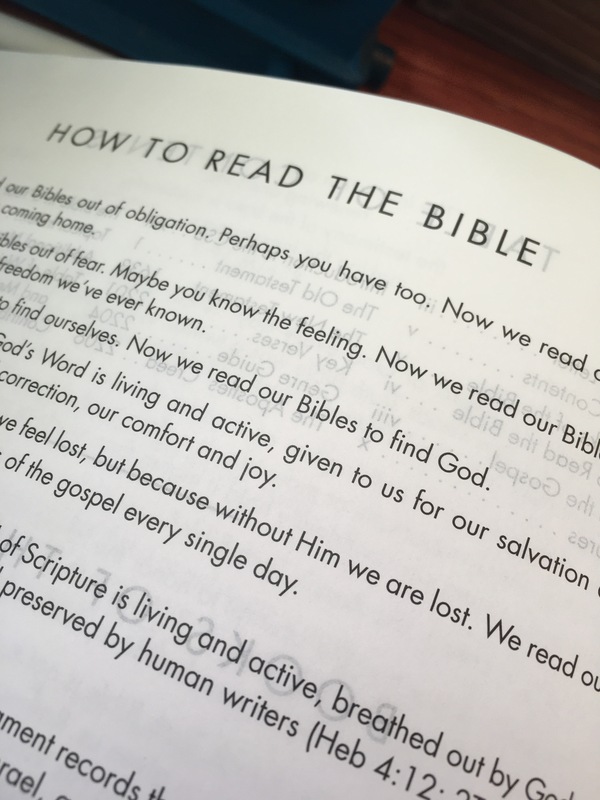 The first thing you come to in the Bible is a “How To Read The Bible” article. It is extremely helpful. I often have people ask me just this question. This lays it our very succinctly. 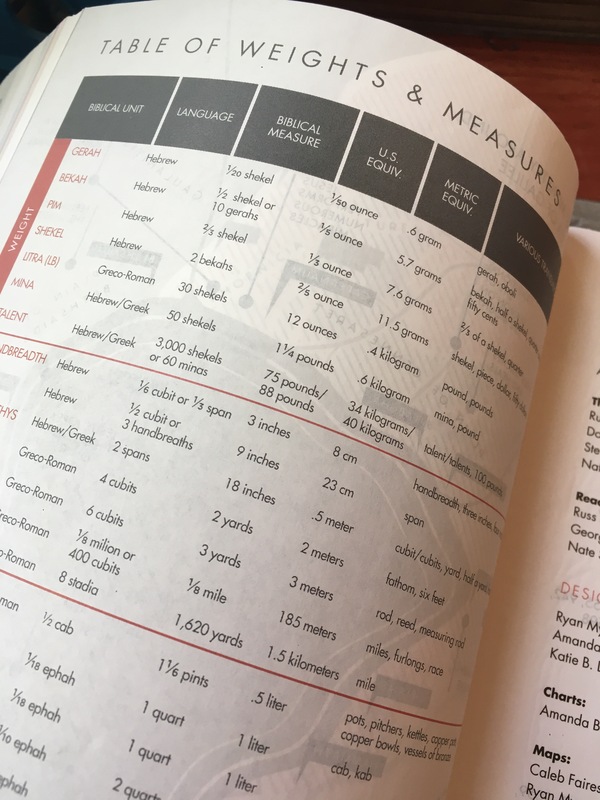 There are also study guides in the front of each book. 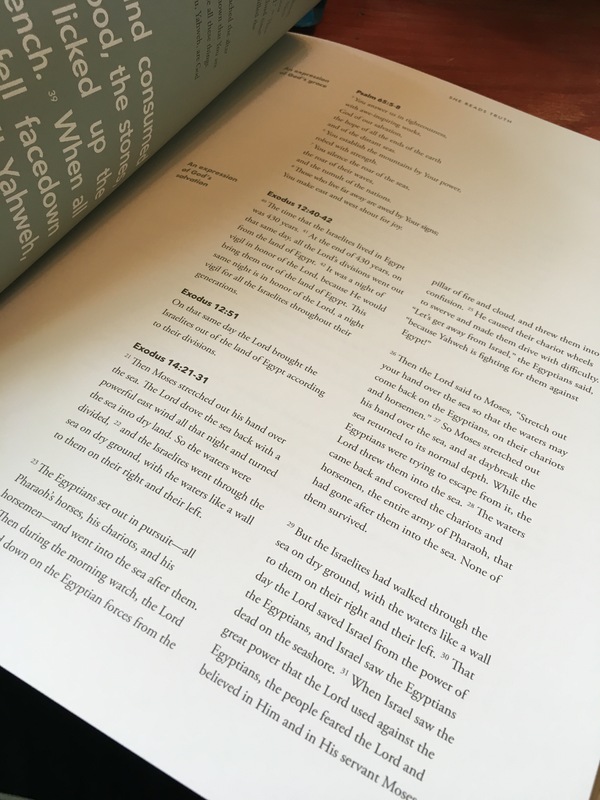 They have a reading plan for that book that includes references to other places in the Bible for a deeper, fuller understanding. Next, you come to an article called “This Is The Gospel”. As a Wesley-Armenian, I often have a difficult time finding theologically appropriate study materials. So, I was a little hesitant to read this article. I was sure they would disappoint me theologically and then I might not enjoy it as much. However, that was not the case. She Reads Truth is very based on Scripture, so theologically, they were right on track. 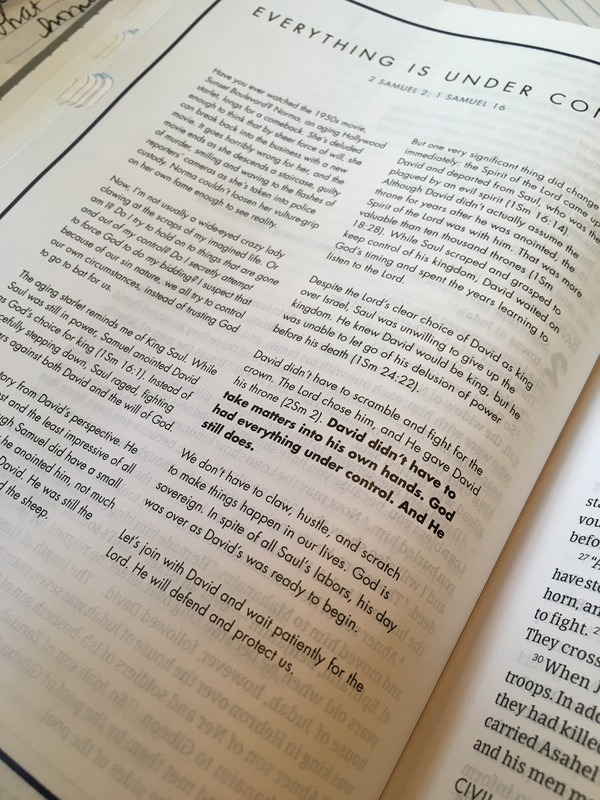 It is sad when you are delightfully surprised to not find heresy in your Bible. But I was. 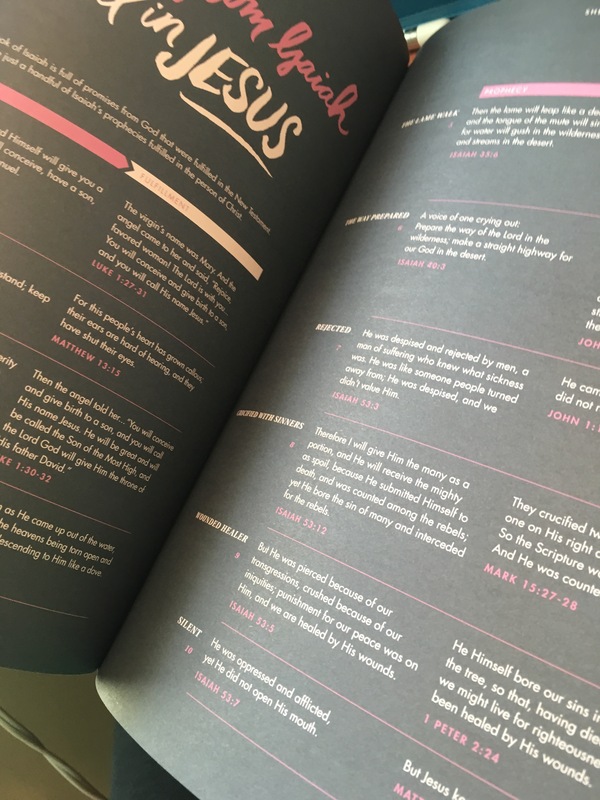 Each book of the Bible has the key verse of the book illustrated beautifully to begin the book. 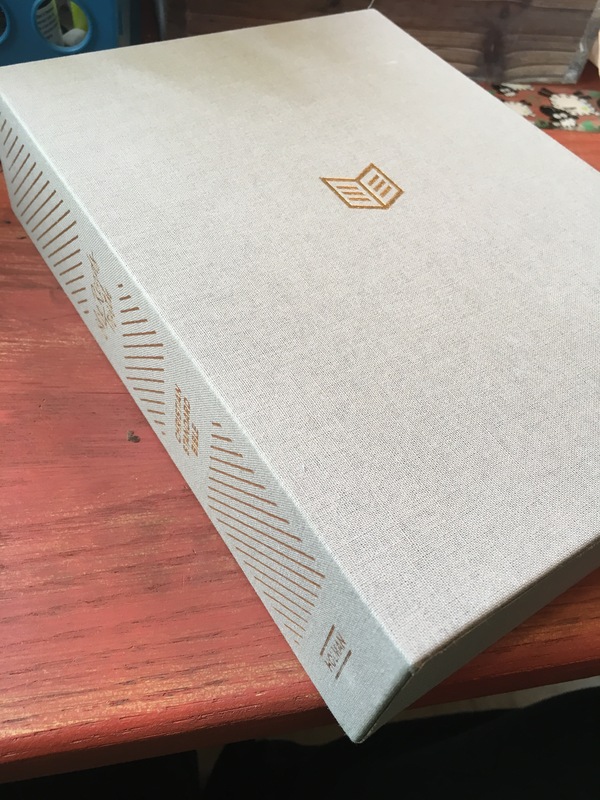 There is an intro page for each book, giving you the background and setting of the book to give you some context for the writing. 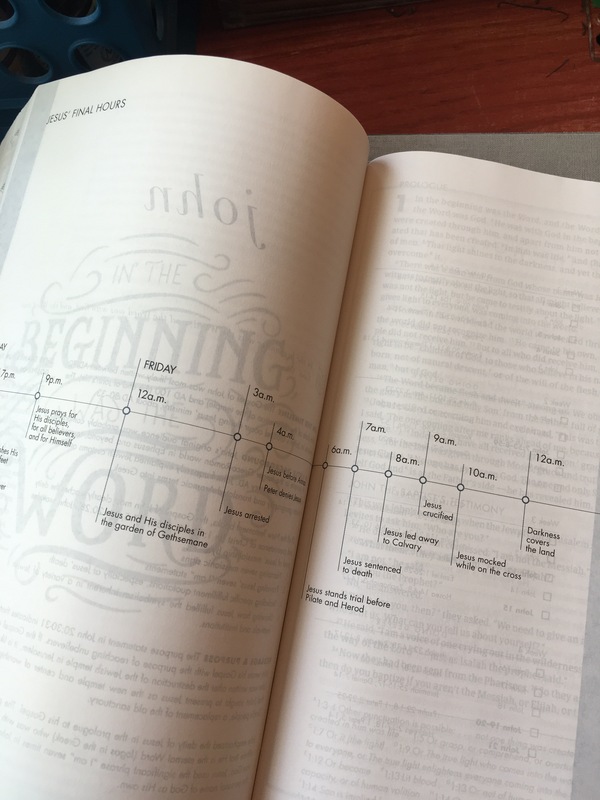 Each book also contains a timeline, map, or chart that is helpful in reading that book. Genesis has a timeline. 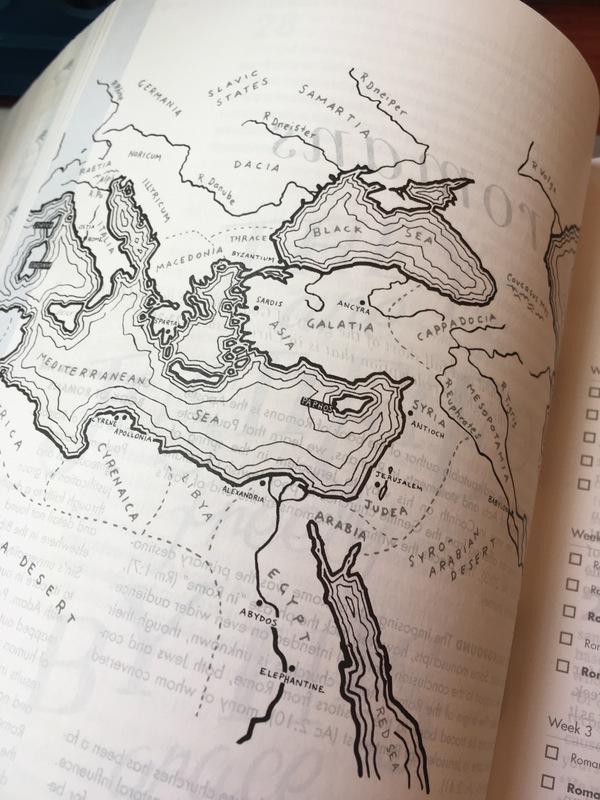 Exodus has a map. 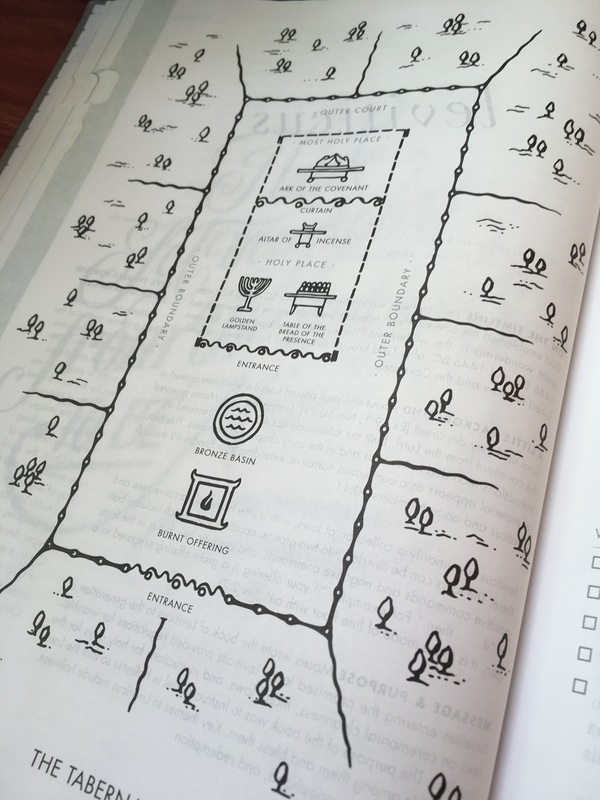 Leviticus has a diagram of the tabernacle. You get the picture. 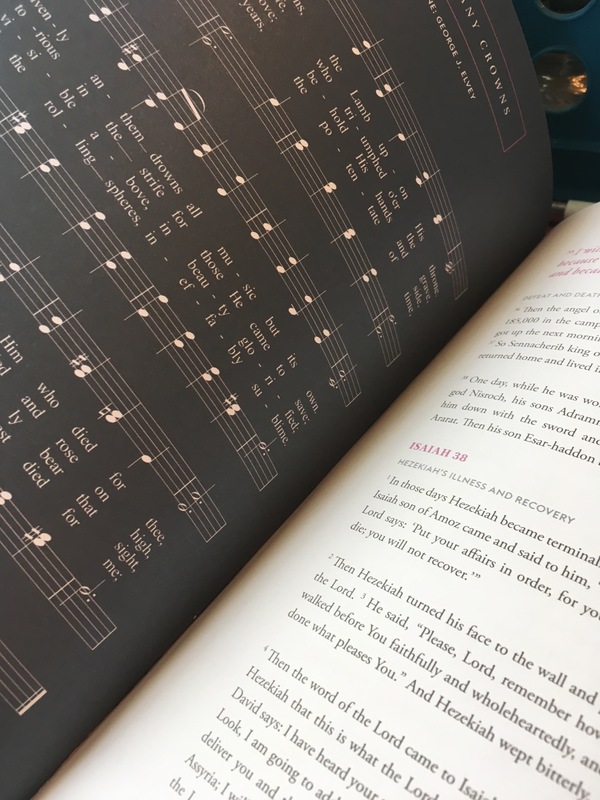 And as I said before, each book has a reading plan, complete with additional verses from other books. It is broken down into 5 days per week. The number of weeks depends on the book. I love the formatting. Single column with a slight margin. 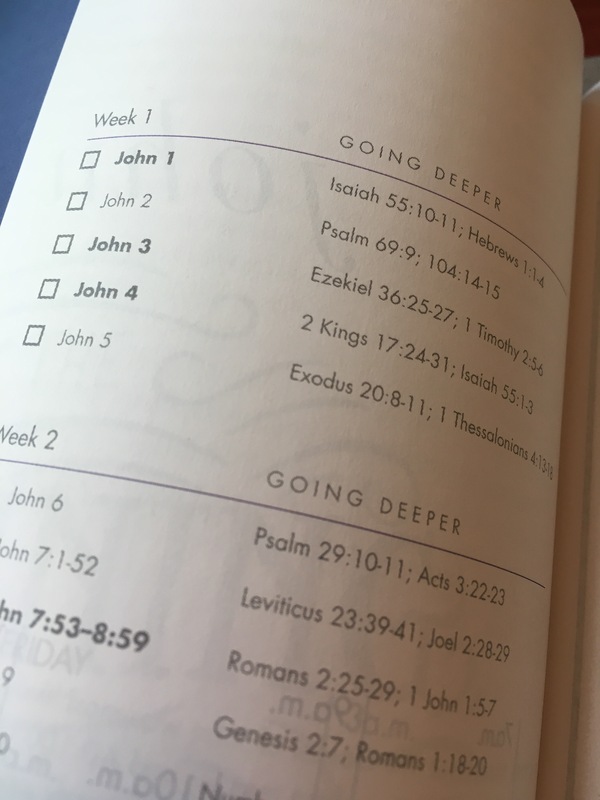 This margin might be wide enough to do Bible journaling in, but I will reserve it for notes. There are also very clear footnotes at the bottom of each page. They aren’t tiny and hard to read. The paper is really thin. 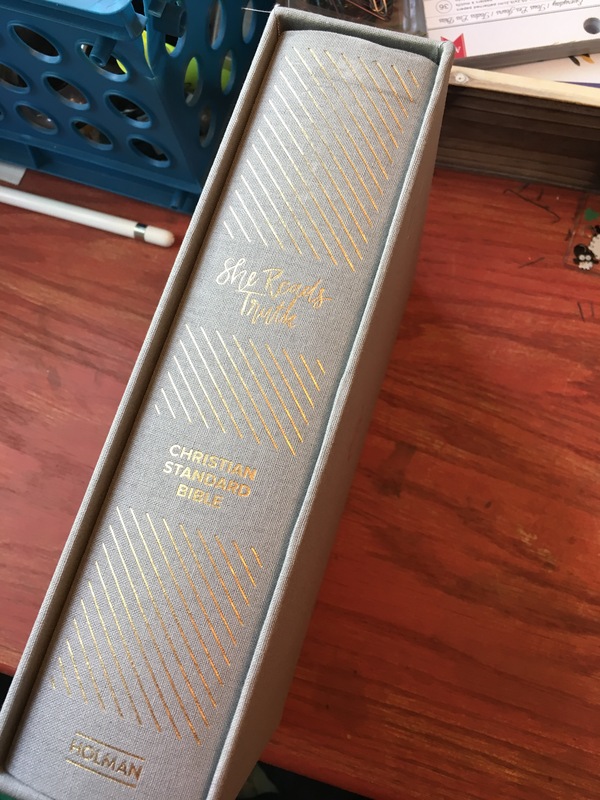 Thinner than most Bible paper. 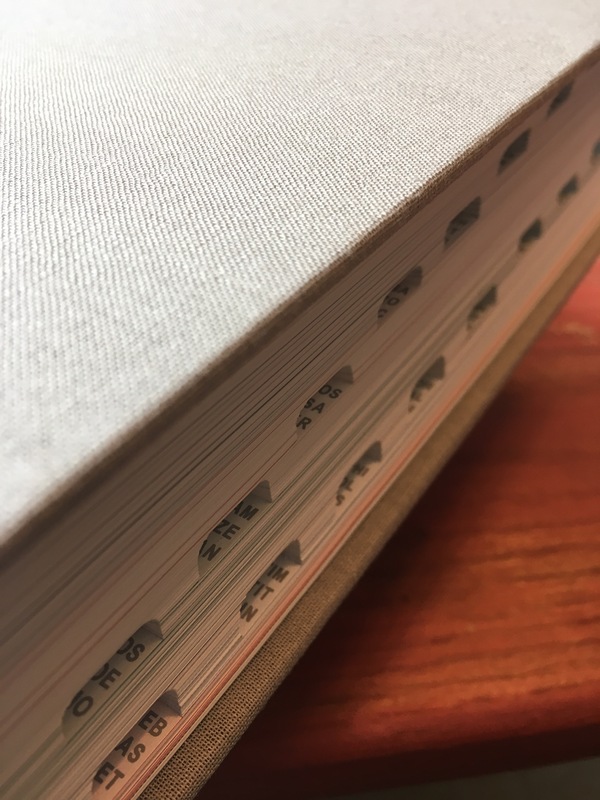 I’m sure you can tell from the photos that the paper is thin, since you can see through the page to what is printed on the other side. I found that gel highlighters work best for this paper, since they don’t show through at all. However, for margin notes, you’re going to have to deal with being able to see through it. You could use a pencil, but I am not a pencil person. 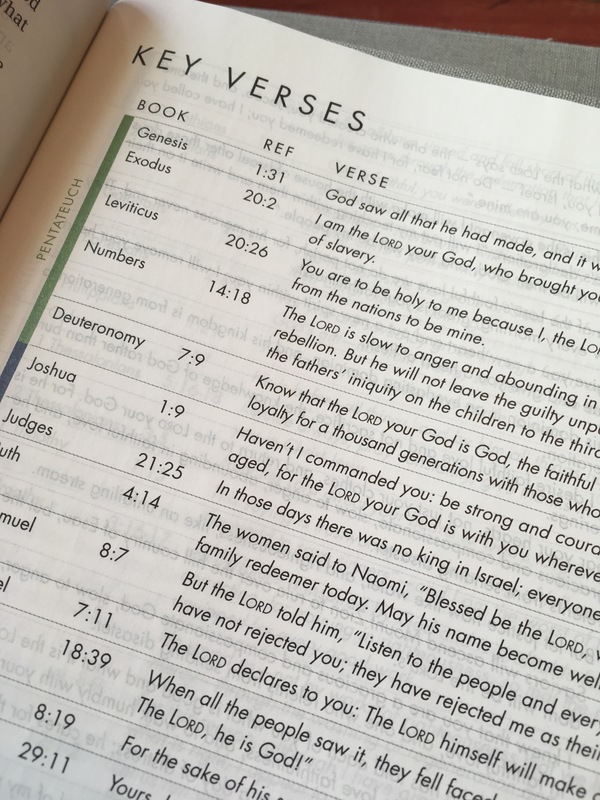 There are also various devotions found throughout the Bible. They are a single page, two columns, and easy to find. 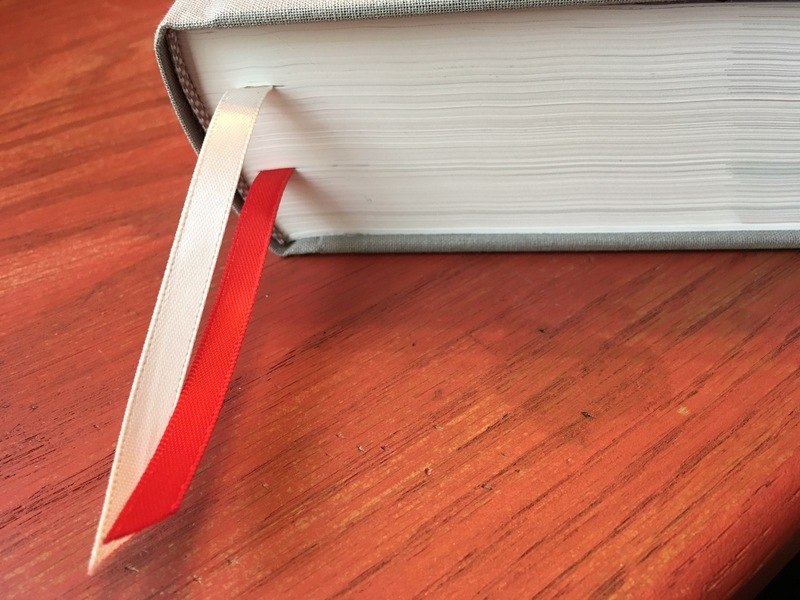 Another awesome feature is that this Bible has TWO satin bookmarks! So you can hold your place in two places at once! 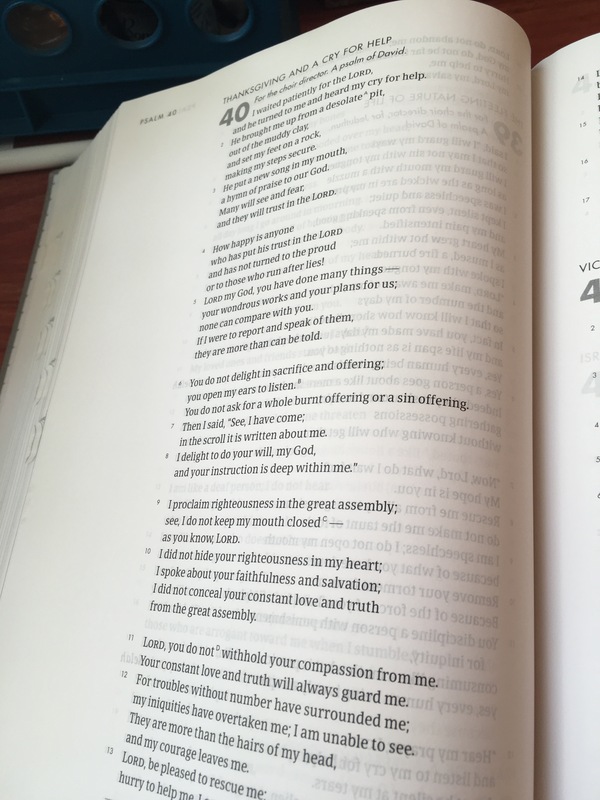 All in all, I am loving this Bible! I cannot wait to dive into it and use it on a daily basis. 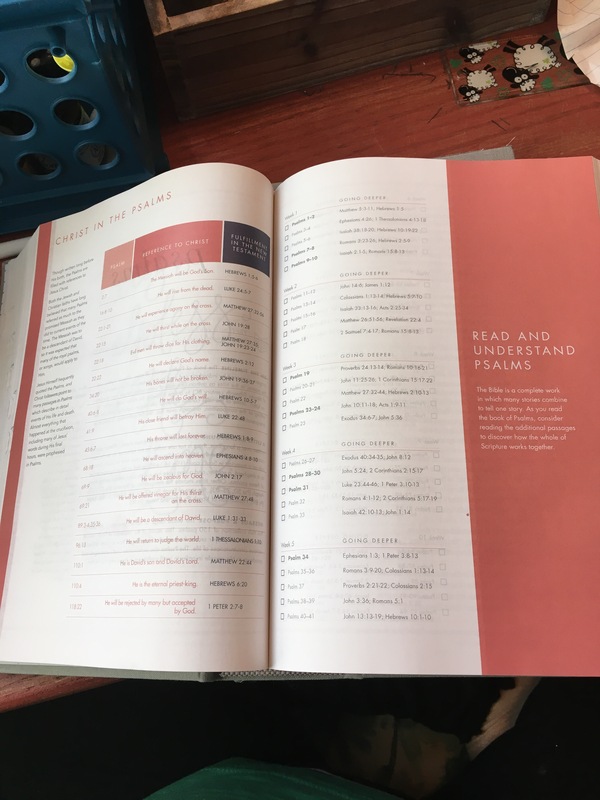 I think it is a wonderful resource and could be very helpful if you’re looking for something to help you get into God’s Word more regularly and with passion. 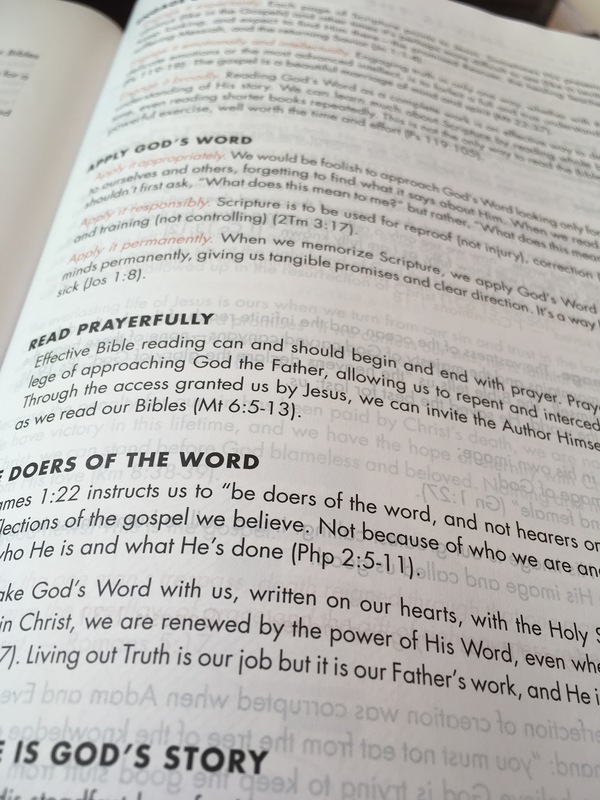 They clearly put a lot of thought and attention to detail in their devotional plans and their new Bible.